Emmenagogues are herbs that stimulate or increase menstrual flow. Women use emmenagogues to stimulate menstrual flow when menstruation is absent (amenorrhea) for reasons other than pregnancy, such as hormonal disorders or infrequent/very light menstruation. They can work in a variety of ways, but the end result is menstruation. Its action can be mild or strong depending on the herb. The herbs are generally made into a tea and drunk a couple of times each day for ten days then ten days of rest. Fair warning: none of the recommended herbs are particularly tasty, but it isn’t the taste that you are seeking; rather it’s the natural chemical constituents that the plants possess. Besides, it is perfectly acceptable to add things to these teas. Most people will sweeten the tea to improve its flavor but the addition of vanilla or licorice are both great options to improve flavor. Dried or fresh citrus (orange, lemon, lime, etc.) peel is also a great addition to improve the flavor. Don’t add alcohol though as it will not disguise or improve the flavor and the alcohol may well damage the constituents. Besides pregnancy, periods can be late for many other reasons, including poor diet, anxiety, and travel. Additionally, under stress and illness, your body might not respond to ovulation. If ovulation is delayed, periods will also be delayed by a few days. If you suffer from irregular periods, an herb from the mild category of emmenagogues may help you. The most commonly-used, mild strength emmenagogues are: yarrow, ginger, feverfew, rosemary and sage. They will stimulate menstruation. Although recipes abound, you will need to experiment to find the correct dosage for you. 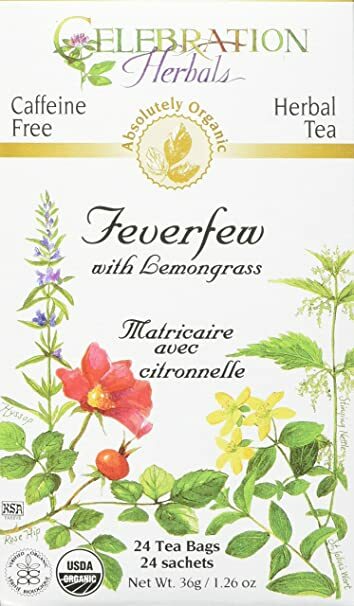 Suggestion: Drink an infusion of feverfew not exceeding four cups per day. Feverfew has multiple pharmacologic properties including as an emmenagogue. If your period is delayed for more than four to five days and not responding to a mild category emmenagogue, perhaps a medium strength emmenagogue would be suitable. Parsley, Queen Anne’s lace seeds, Black Cohosh, Mugwort, and Juniper are all considered medium strength emmenagogues. Suggestion: To use Queen Anne’s lace seeds, take four to five fresh seeds from the flower head. Chew them thoroughly to release the oil and swallow with water or juice. If the seeds are swallowed whole then they will not work as they will simply pass through your system. Queen Anne’s Lace, also called Wild Carrot, has been utilized for at least two thousand years as an effective emmenagogue and anti-fertility agent. Take caution: the strongest emmenagogues can also be classed as abortificants – substances used to prevent or terminate early pregnancy. These herbs include Angelica, Dong Quai, Blue Cohosh (not to be confused with the mild strength emmenagogue Black Cohosh), Birthwort, Celery Seed, Pennyroyal, Rue, Tansy and Vitamin C. Vitamin C, also known as ascorbic acid is necessary for the growth, development and repair of all body tissues. However, according to “A Woman’s Book of Choices: Abortion, Menstrual Extraction, RU-486” by Rebecca Chalker and Carol Downer, 6-10 grams of ascorbic acid a day for 5-10 days is enough to terminate an early pregnancy. If your period has been absent for 3 months or more, consult your doctor to determine if you are pregnant or if another underlying issue is at play. If pregnancy has been ruled out, you can try these natural herbs to guide your body back to its regular process.